I have been really excited about blogging and have completed so many projects to share and Everett is growing like a weed that there are so many things I want to share. Recently I had Everett's Christmas photos taken by my good friend Emily. She has a great blog Emmy Mom, that I discovered after we had met at a local blog social. 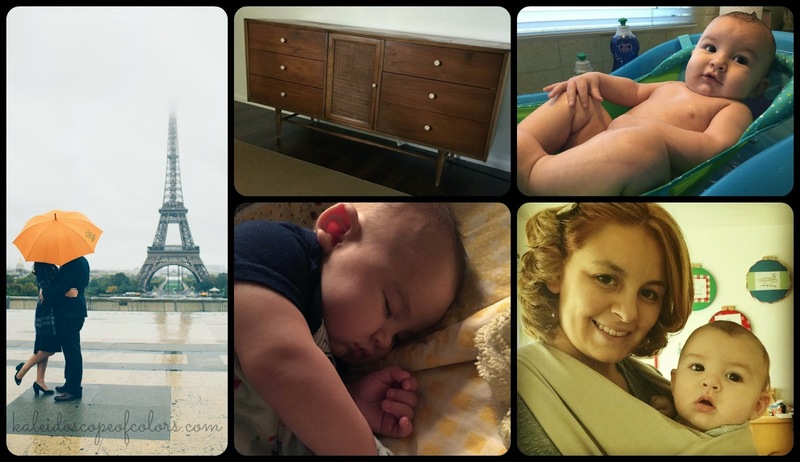 She does this great post every Friday where she shares 5 thoughts and 5 photos from the week. I love this idea so I am going to try it. This is going to be a challenge but I am really going to put forth the effort to post each Friday. 1. Completely done with Christmas shopping. *whew* The thought of taking Everett out shopping during the rush really gives me anxiety, so it is finished before black Friday. 2. I celebrated my 31st birthday this week, last year for my 30th birthday I found out I was pregnant while we were on our Europe vacation. Evidently we picked up our son in Paris and found out while we were in Italy. Everett is the best gift ever. 3. I'm 31 and Everett is 4 months. He did well with his check up and his shots, currently 17 pounds and 25 1/2 inches long. 4. All of my fall decor is put away because I need to start on Christmas now, otherwise I won't be finished in time. It is really tricky trying to do anything with an infant. 5. My husband's birthday is next week, our birthday's are 11 days apart although he is a year older. Both of us are intense, passionate Scorpio's. I had to include a throwback photo from last year when we were in Paris. What a difference a year makes. Included a photo of my craigslist mid-century credenza score! A photo of Everett getting a bath after Mommy & Me class, he pooped through two diapers and two onesies. YIKES! My precious boy sleeping makes my heart melt and us together. He loves the Moby so much, but I think he just loves being next to me more. He loves his momma. Until next Friday, wishing everyone a blessed week ahead.